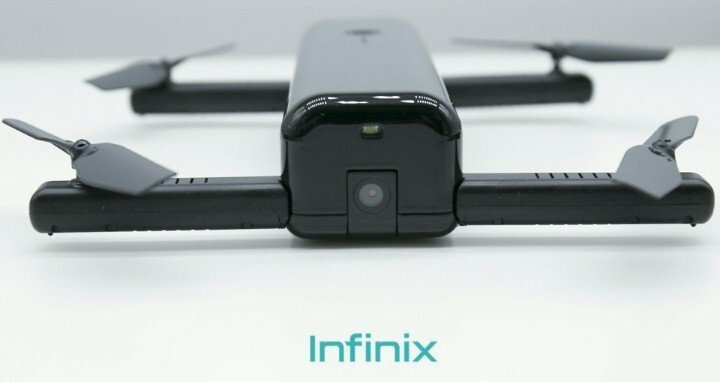 Infinix has launch her first drone, the Infinix XF01 in Philippines. Few months back, precisely in August this year, Infinix Philippines Brand Manager, Zaks Yu, announced in a Facebook group the company’s decision to stop selling smartphones in Philippines for the time being, due to high operation cost and low profit yield. The company claimed to have suffered much losses that it can not, for the time being ship it product to the Philippines market. To complement this decision, the company promised to bring impressive Infinix smart accessories and other cool gadget to it Philippines fans, pending when their smartphones becomes available again, and that brings us to the Infinix XF01, among other great Infinix accessories. The Infinix XF01 is an ultra narrow pocket drone aircraft, with built-in HD camera. Like many similar camera drones out there, the XF01 comes with 4-axis adjustable wings, each having a propeller guard. The device is designed with a whole 6-axis gyro sensors and optical flow positioning. These sensing optics helps the device to maintain a better hovering and stable flight.